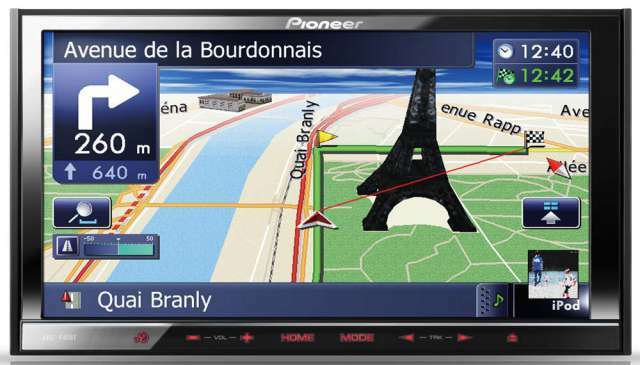 Managing your car's navigation and entertainment system has never been easier. The 7-inch WVGA touch screen can be customised to your personal menus whilst Advanced App Mode allows you to access an ever-growing number of iPod touch/iPhone 4/4S compatible apps directly from your car dashboard. If you prefer to keep your hands on the wheel, the voice-activated speech commands let you control your navigation, phone calls and your multimedia without lifting a finger. Latest Navteq maps of 44 European countries, including 154 detailed city maps and 3D visualisation of major landmarks. NavGate Feeds PC application allows you to add POIs with Google Maps and ViaMichelin (6.9 million pre-installed POIs). Text-to-Speech (TTS) provides voice guidance and relays traffic information from the Traffic Message Channel (TMC) in 18 languages. Voice-activated Speech Commands control a number of navigation, Bluetooth and audio functions. Climate and Parking Sensor data displays vehicle bus related information. Check compatible vehicles & functions. Drive Report tracks journeys and Eco Drive analyses driving performance (e.g. acceleration, braking and CO2 emissions). AM/FM radio, standard audio/video formats (CD, DVD, USB, Micro-SD card) and direct iPod/iPhone control (with optional cable). Advanced App mode enables music and video from your iPhone / iPod touch Apps and functions with other useful and compatible Apps. Auto EQ (with optional microphone) matches your external device to the acoustics of your car. 3 hi-voltage RCA Pre-outs connect additional amplifiers, speakers and subwoofers. Dual Zone function sends music to the front passengers from one source, whilst rear passengers can watch video on the optional screens from a second source. A Parrot Bluetooth module seamlessly pairs with your phone from anywhere within the car and it stores information from up to 5 different phones and up to 1000 contacts per phone. Map Type Pre-installed on built-in flash memory . Dual Zone Entertainment: You and your passengers can enjoy different AV sources at the same time. For example, whilst you and the front passenger listen to the radio and use the navigation system, the rear seat passengers can watch a DVD or TV. Text-to-Speech Voice Guidance: Text-to-Speech Capability (TTS) audibly announces city names on your journey. This makes following directions easier, as you can clearly understand the voice guidance instructions when real place names are used. Text-to-Speech Capability: audibly announces city names on your journey. This makes following directions easier, as you can clearly understand the voice guidance instructions when real place names are used. Voice Recognition lets you give voice commands to control a number of navigation, Bluetooth and audio functions. Voice Recognition: lets you give voice commands to control a number of navigation, Bluetooth and audio functions. This technology can recognise and accept words in conversational speech, by filtering out any unnecessary sounds and phrases, so you don't have to memorise a list of preset commands. Voice recognition functions other than address input work with the listed 6 languages independent of country; for example, in Belgium you can use Dutch or French for hands free call by voice. Navigation Coverage: 44 European countries and 9 million kilometres of road:UK (incl. Northern Ireland), Germany, France, Italy, Benelux, Austria, Switzerland, Spain, Greece, Portugal, Denmark, Sweden, Finland, Norway, Ireland, Czech Republic, Slovakia, Hungary, Poland, Monaco, Liechtenstein, Andorra, San Marino, Vatican City, Gibraltar, Croatia, Slovenia, Estonia, Latvia, Lithuania, Turkey, Malta, Romania, Ukraine and Bulgaria. Points of Interest (POI): 6.9 million - A Point of Interest, or POI, is a specific location that you may find useful or interesting during your journey. Points of Interest are places like hotels, restaurants, petrol stations, tourist venues, parking lots; even cash machines. The sat nav systems have a large amount of POI's stored in memory. Create your own POIs such as sports clubs, shopping locations and golf clubs from the internet, and add them to your sat nav system. Virtually any location, such as camping grounds, ski resorts, stadiums or tourist destinations, can be created as points of interest. You simply make a note of the address details in a CSV format file and NavGate Feeds searches for them via a web search, converting the data so it can be read by your sat nav system. Create driving reports, particularly useful if you need to calculate your travel expenses in a given period, this application will keep track and provide you with an overview of all the journeys you've made and the number of kilometres travelled. NavGate Feeds is available for your PC, iPhone* or smartphone* and you can download it for free. Drag & Drop Menu Setting: Create your own short cut menu which can act as your home menu. This makes it easier to access you most frequently-used functions. Simply drag and drop icons into your menu to act as a quick link to these functions. City Maps; enable you to view selected European capital cities and metropolis areas in closer detail. * The compatibility information is based on the above-mentioned firmware version. * iPod shuffle is not supported. Only iPods with a "30-pin Dock Connector" are connectable. Sonic Center Control: Sonic Center Control is a listening position adjustment tool, which lets you optimally tune the audio output based on where you (or your passengers) are sitting. By changing the position to the right (as shown in the screenshot), the sound image will move to the right. The driver's side speaker timing is adjusted, with the result of an improved sound stage based on your listening position. This feature takes the sound delay data used by DSPs and translates it into an analogue version using phase delays. However, in order to mimic a DSP's sound delay, frequencies can only be altered up until midrange.